Award-winning Greenes Restaurant in Cork is hosting a unique pop-up dinner event on Friday the 24th of February when executive head chef Bryan McCarthy will co-chef with chef JP McMahon of Michelin-star restaurant Aniar. 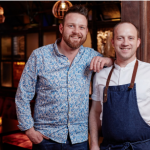 Both chefs are devoted locavores, so diners can expect a modern Irish menu showcasing the very best of local, seasonal, foraged and organic ingredients. 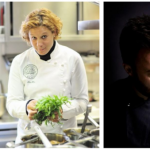 The four Hands Dinner costs €120 per person for 6 courses and includes wine pairings. Reservations are via the Greenes’ website at http://greenesrestaurant.com or by phoning Greenes on 021 455 2279. Greenes Restaurant is located at 48 MacCurtain Street, Cork. The food at Greenes Restaurant is innovative, modern and devoted to place. Bryan McCarthy heads up the kitchen team at Greenes and recognises the uniqueness and quality of the outstanding ingredients that are available in Cork. His talented team works in tandem with the best of Cork’s food producers and in other parts of Ireland to create a menu that’s devoted to local, seasonal, foraged and organic ingredients. Expect signature dishes of a seasonal nature, refined food with a simple food philosophy – local, fresh and staying true to each ingredient’s essence. Traditional food practices, such as pickling and fermenting, together with innovative techniques, as well as quality, sustainable meat and fish, and locally sourced organic vegetables and herbs, have transformed Greenes into the destination restaurant that it is today. Frank Schiltkamp is restaurant manager and sommelier at Greenes. A qualified, experienced restaurant and wine expert, Frank enjoys getting the best out of his team to ensure the best possible experience for guests of Greenes. Greenes is located in a former bonded warehouse in Cork’s historic Victorian Quarter in the centre of the city.